Are you new to microblading? Are you looking to build your microblading business? Even if you aren't maybe you are wondering why some artists seem to be overflowing with clients while you may be struggling. 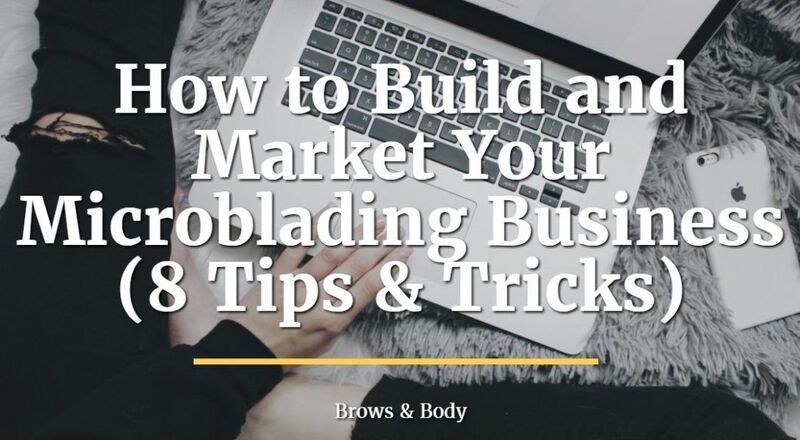 In this guide you will learn the most effective ways to market and build your microblading business and how you can stand apart from the crowd. Microblading is an amazing and new opportunity which can help you to build a primary or secondary income stream. This is especially true if you are already in the cosmetic industry! Chances are if you are reading this then you've already been through microblading training and your next step is to build your business. If you haven't gone through this step then make sure to check out our training program which teaches you the basics of microblading and also how to market your business (much of this article is from our marketing and business building strategy in our course). So how do you go about building your business? Well first we need to talk about what marketing actually means. Marketing is basically summed up as getting yourself out there and showing people what you do. Obviously this is a very broad topic which is why you need to understand specific strategies on how to make it happen and we will discuss the specifics below. What you need to understand is that you HAVE to be working on building your business. It's NOT enough to simply get training and then have a "if you build it they will come" mentality - because they won't come! You need to get ready to get out of your comfort zone, start hustling and building your business. All of the strategies that we are going to discuss are very effective and they are the exact same strategies that we've used to build our business. Active marketing and passive marketing. Active marketing requires A LOT of time and energy on your part. While passive marketing is something that sits back and happens while you aren't working on it. It's important that you have a mix of both of these types of marketing. As you start building your microblading business you will need to focus more on the active marketing and then switch to passive marketing as you grow. The first step is to simply be good at what you do. All of these strategies that we are going to discuss will only work if you are already skilled and confident in your services. If you aren't then you should go back to the basics and start practicing drawing your brows or maybe consider taking another or more comprehensive training course. When it comes to the cosmetic industry you have to realize that most people will judge you based on the quality of your work. This quality is immediately evident in your portfolio which includes before and after photos! If the quality of your work is not up to par then it doesn't matter how many eyeballs you get looking at your work, none of those people will want to work with you. For this reason the number 1 step is always to make sure that you are GOOD at what you do. If you aren't spend your time and energy on improving your skill before moving on. If you are someone who is already a cosmetologist, registered nurse or tattoo artist then you may be able to lean on your other services for some time while you build up your existing business. But don't take this as an opportunity to NOT practice microblading. This next step is relevant only for people who are ALSO doing other procedures. Most people who become microbladers are already doing other things such as eyelash extensions, hair, facials, peels, dermaplaning, microneedling and so on. If you fall into this category then you need to make sure that you focus on only a few things. It may be tempting to offer a wide array of services, but most people get overwhelmed with multiple options. Instead you should focus on a business model which outlines only very specific services and focus on doing those services incredibly well. This is the same business model used by companies like Apple and In-and-out Burger. If you attempt to build up more than one service at a time then you will only slow down the growth of ALL services. Instead focus on ONE service and build that. I recommend you do this with microblading first because the cost/hour is high and will allow you to focus on other things at a later time. The next most important step is to display only very high quality before and after pictures. Before and after pictures will be the lifeblood of your microblading business because they showcase your work in your portfolio. You probably know before and after pictures are important, and we will talk about how to show these off later, but here I want you to understand about the quality of these pictures. The microbladers that you see with thousands of followers on instagram have AMAZING photos right? These people are not simply taking photos with their phone and posting them. They are actually crafting high quality images using proper lighting and a high quality camera. This means that you should be investing in some basic equipment to help you get these high quality photos. It may seem like an extra expense but it's an expense that you shouldn't wait for. Spending money on high quality equipment will help you build your business faster by helping you take better photos and by increasing referrals to your business. Ring Light - The ring light will help illuminate the face, reduce shadows and provide perfect lighting for before and after photos. You can tell if someone else used a ring light in their images because you can often see a ring in their eyes in the picture! High Quality Camera (Iphone 6+ should work or similar) - Most cameras nowadays provide very high quality images and that includes phones. Even having a decent camera is sufficient as long as you have awesome lighting. Consistent Background (or White Background using white stock paper) - When taking pictures think about how you want to brand your business. That means using a consistent background or location to take your photos. Make sure you spend some time practicing before your clients come so you can easily and quickly get both before and after pictures. Also never let a client leave your studio without getting these pictures! This should be top priority for you. You probably know that it's important to have a website, but do you know why? How did you end up on this page? Did you search for it in your browser? Did the result pop up that interested you? That's the exact same way that MANY people find what they are looking for! This process is known as organic traffic and the vast majority of this traffic occurs through google. Many of your prospective clients are typing in something like this: "Microblading + the name of their city". 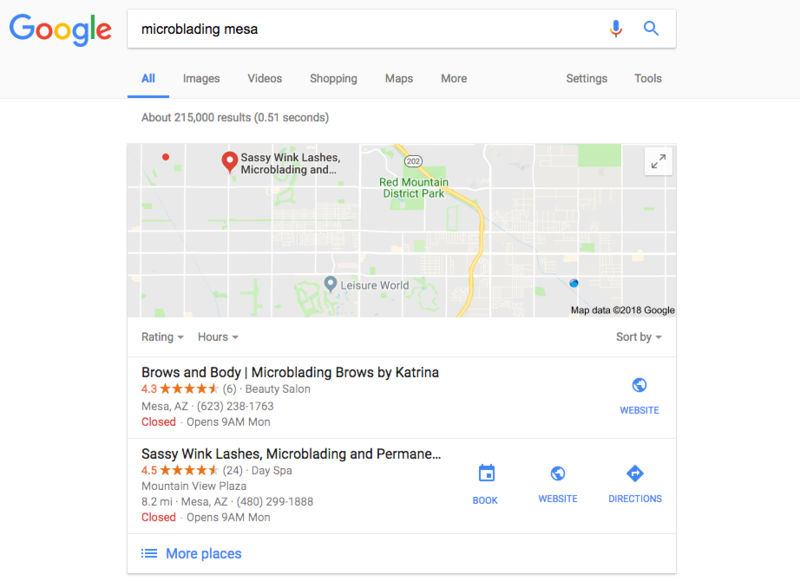 So for Arizona clients they are often searching for "microblading mesa". What pops up when they search? You can see that several results all pop up and these are all local businesses. What you may not have realized is that it's not an accident that people are up in the higher spots and it doesn't have to do with reviews. Having a website, and using it correctly, will help you get to the top of that list and you will automatically show up for some of these keywords that people are searching for. This is a type of passive marketing and it's something that you want to have for your business. You can basically sit back and watch as people continually find your website and call/text you for appointments. The problem is that it isn't super easy to set up and so many artists either don't have a website or they don't have a very good one. Simply having a high quality website will put you in a different league and really set you apart from the rest. Now we finally get into social media. Social media is a great way to attract new clients but it's also something that requires a lot of time and effort. You need to constantly be uploading new photos, adding new posts, engaging with your audience and so on. For this reason you want to stick to the social media platforms that work best for visually oriented businesses (like instagram). Does that mean that facebook is not worth it? No, not at all, but it's not the platform that you want to spend most of your time on. You want to be using facebook appropriately by creating a business account, uploading before and after pictures to build your portfolio, creating business information on the page (hours of operation, services provided and so on). Facebook is great because google will crawl the information you put on your business and make sure that it matches information other places on the internet. So make sure that you put this information in CORRECTLY! And also make sure you don't use your personal account as your "business account". One potential downside to using facebook is that you may innocently log on to post photos or update your business information and inadvertently be sucked into your news feed or something else! This is one reason using facebook is also potentially a bad idea. Instagram is probably the king (or queen) of social media if you are in microblading. Instagram is primarily a visual social media platform which works out great for anyone who is in a field where it's easy to show off your business with pictures. Microblading fits the bill perfectly! If you are a microblader you NEED to be on instagram. It is one of the easiest ways to build your business as you get started. Just like facebook instagram will soon be reducing the REACH of all of your posts if you have a business account. Well let's make it simple. Let's say that you have 1,000 followers on instagram. If you post a picture you would assume that your picture would be shown to all of those 1,000 followers, right? Well instagram is limiting that reach down dramatically so if you post a photo it may only show to a small fraction of that total number, something like 50%. Facebook has done the same thing with business accounts over time to the point now that only around 4-6% of your audience will see anything that you post. Instagram (now owned by facebook) is most likely following this pattern so you should expect this reach to decline over time. In our example that means that out of 1,000 followers only 50 to 60 people may actually see your business posts. Because they want you to pay them money to boost your post. Because of this I recommend that you don't heavily invest in only one marketing method! Because at any time instagram or facebook can change their policies and change your business overnight. If you have all of these marketing strategies in place then you are protected against changes. 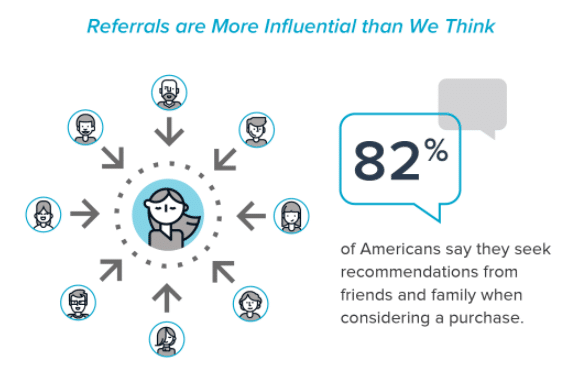 If you've been in business for any length of time then you know that word of mouth referrals are the absolute best type of referrals that you can get. These clients come in ready to get the procedure done and they usually have very few questions. These type of clients come after talking to or seeing your results from OTHER people. The beauty about these types of referrals is that they require very little effort on your part! All you have to do is provide super high quality work and beautiful brows and your clients will keep coming. The downside to this type of referral is that it is VERY slow and takes a lot of time to build up. It's also difficult to get a steady stream of clients from this source of referral traffic alone. But your goal should be to have automated marketing systems in place that help drive new clients into your business which you can then have them provide you with more referrals through word of mouth. This system is the ultimate system that you should be setting up, but just realize that it can take years for it to kick in and become 100% autonomous. This is one of the more important steps that we are going to discuss today. And while it isn't exactly a marketing strategy it is still VERY important nonetheless! The grind is a reference to the fact that working on your business can sometimes wear you down, but the key to success is to grind it out and to hustle. Many people will start a business but very few actually succeed. The ones that succeed are the ones that work at it every single day. Even just a little bit, but the key is that you can't stop. If you stop putting work into building your business then it simply won't grow and you will stay where you are now. So what does the grind mean? It means that you grind out the marketing techniques that we've discussed above until you start to see results. It may take months to start to see real improvement but they will come. I can vouch that this system does work. The key to success is putting in the time and pushing yourself to continually grow. I'm in the process of creating a marketing video series and guide that is designed to walk you through these steps to make this process easier. It includes how you use facebook appropriately, how to use instagram, how to get more word of mouth referrals, how to incentivize your clients to leave reviews and much more! If you are interested in learning more about this program please leave a comment below so I can put you on the list and let you know when it's available. My goal here is to help you along your journey and I want you to be successful and happy and do as many brows as you possibly can! How has building your business been going? What areas do you need to improve on?